www.cla-travel.asia - Jom Travel ! Life is boring ? hey, who says that ! life must be lived to the fullest. Enjoy it while you can. Go somewhere and do something. No money ? Traveloka know it ! that's why Traveloka run a contest, namely CNY 2018 Contest. The terms and conditions are so clear, easy to follow - simple like an ABC. My explanations are just wasting your time, you'd better click CNY 2018 Contest, read the rules and start playing the games. Who knows you can score higher mark and win the grand prize. Grand Prize : Seoul, Korea. Yes, it is 6 days 5 night free trips to Seoul, Korea and of course the tickets are returned. 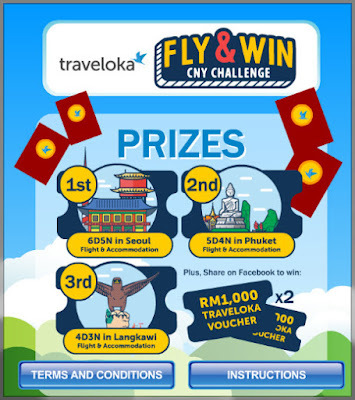 and, RM1000 Traveloka voucher for the consolation prize. Hurry ! because the contests will be running until 28th February only. kalau lah dapat menang pi korea tu kan best.. mesti rasa nak melompat happy.. korea kottt nak pulak 6 days 5 nights..